For as deep as the 2017 draft class is on defensive ends, many would argue that it is lacking in the interior defensive line department. Outside of Jonathon Allen and Malik McDowell (and maybe Jaleel Johnson or Caleb Brantley), it is hard to see any of these defensive tackles getting themselves drafted in the first round. There will be some solid defensive tackles taken on Day Two, however, and leading the way for those interior beasts is Clemson’s defensive tackle Carlos Watkins. Watkins is a big, rather prototypical defensive tackle with the ability to push the pocket against the pass, and control/shed blockers against the run with his long arms. First things first, Watkins is a physical, powerful player. He is committed to gaining hand position inside the offensive lineman, and uses his arm length to his advantage by creating separation from blockers, keeping his chest clean, and bench pressing the lineman into the backfield. Watkins is certainly not an explosive player, even for a defensive tackle, but he knows how to use his strength to his advantage when pass rushing, using an excellent bull rush and heavy hands. Here we see him do an excellent job of hooking the inside arm of both offensive linemen to clear up room for the stunting defender, but is able to split the blockers with his powerful upper body, and get the sack. His size and athleticism are his two most redeeming qualities, and are really the only things which make him a Day two player. He is able to overpower blockers off the line of scrimmage, and push the pocket from the interior and stop quarterbacks from stepping up in the pocket. Here is a perfect example of Watkins’ strength. He has a decent get-off on this play, slanting down towards the center to clear up room for the looping defensive linemen. While he is unable to hook the guard’s inside arm, he is able to completely knock the center off his track and get into the backfield. Pressure from the center of the pocket can absolutely kill a play. This works to Watkins’ advantage as pushing the pocket from the interior is his best pass rushing quality. Against the run, Watkins does a good job of gaining inside hands and overcoming his pad level and lack of leverage with his powerful upper body. Here we see him take on and split a double team, discarding of the tackle with a decent rip move. This play was a little more of a mistake by the offensive linemen than a great play by Watkins, but you can see the ability he has to sustain the initial burst of a double team and stand his ground, stalemating at the line of scrimmage and splitting the blocks to make the tackle. Watkins does struggle in a lot of areas, the most noticeable of these areas is his get off. As mentioned earlier, Watkins’ isn’t very explosive off the ball, but the main problem with his get-off is his pad level. Too often he is too high off the ball, standing straight up out his stance. This hinders his ability to be explosive off the snap, but also exposes his wide frame to blockers and allows for himself to be washed down the line of scrimmage, or get pushed out of the play. While Watkins is a good athlete, he struggles moving laterally against the run, hindering his range of defense. He needs to better understand and utilize leverage, and must be technically better against the run. Watkins also doesn’t possess many pass rush moves. His pass rushing is basically limited to a bull rush, and pushing the pocket. While this is necessary for a defensive tackle, Watkins will need to become a better overall pass rusher if he wants to be an every-down tackle in the NFL. Watkins’ size, athleticism, and play strength make him a prospect many teams will want to look at. However, he is not sound technically, and has a lot of areas he must improve on, such as his range against the run and his pad level. 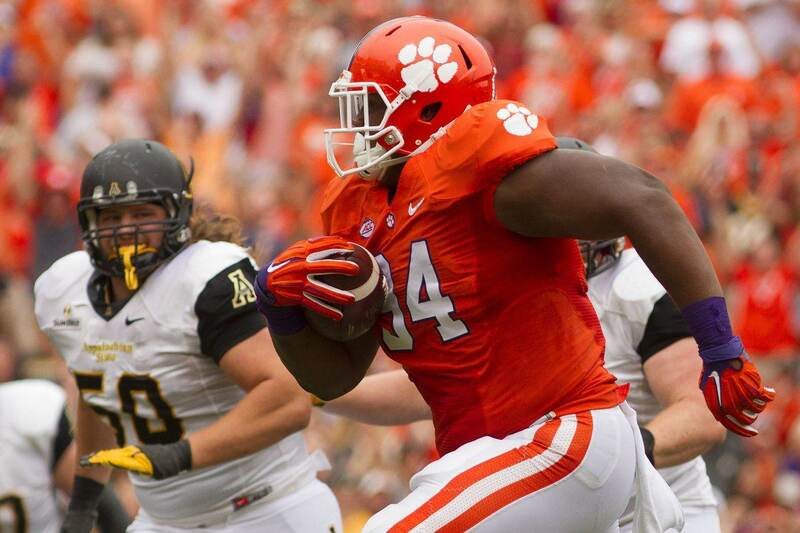 Carlos Watkins is predicted to be drafted towards the end of the second round. Currently, I have a third round grade on Watkins, but would not be opposed to him being taken as a 1-technique in a 4-3, or a nose tackle in a 3-4 in the second round.